Here's a way to track data using Google Docs (in my case) on my Samsung tablet. 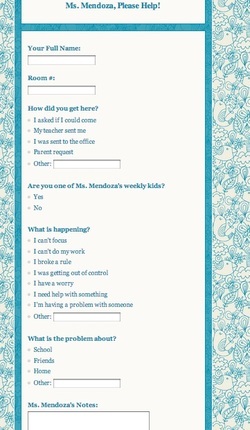 I created this form to fill out when a kid comes to my office and it is either a) a student who is not on my caseload, or b) a crisis intervention with one of my regular kids. The one bit of information I won't get from this is the amount of time I spend on these unscheduled sessions, but I figure I'll worry about that next year. By just collecting this info I'll be way ahead of the game for now. A perk of Google Docs is that when the wireless reception in my office gets squirrelly, I can still access this form on my desktop computer. So far a couple of quite upset kids have been happily distracted by sitting at my desk, picking out a pair of my funky reading glasses to wear, and clicking away on this form. My favorite response so far to "What is happening?" was from a first grade girl: "I'm grumpy." ***UPDATE: While the above Google Doc has been quite helpful, I've found that it doesn't quite cover all the data I'd like to have (like how much extra time I 'm having to spend with kids in crisis, and how that impacts my delivery of services to students who are on my schedule). This information is really important to have in case administrators or parents want to know why I'm not always able to see everyone I'm scheduled to see. That said, the simple tallying this year of the number of extra sessions I've had with students and how many general ed kids have requested to see me has been really eye-opening. With seven weeks left of school, I've had 518 extra sessions, and 48% of those have been with kids not on my weekly caseload! Below is the data collection form I'll use next year (no sense changing in the middle of the year, after all). Go to this page on my blog if you want the link to be able to copy this form into your own Google Docs and edit it to suit your own purposes. Of course teacher input is crucial for assessing whether or not we are providing services in a way that they find helpful and user-friendly. Since this is the end of my first full year in my new district, I figured it would be a perfect time to see if my teachers think I'm accessible, collaborative, and communicative. If you want to copy this form to your own Google Docs, find the link on my blog here.